There are a lot of books and eBooks out there. This means that there are a lot of authors (your humble servant has two non-fiction paperbacks available on Amazon). Because it’s so easy to self publish a book or an eBook, everybody is doing it. Some people go as far as publish books about how to publish a book. But there is only one guy who wrote a book about how he was writing and publishing an eBook. That guy’s name is Glen Stanford and he’s the author of How I Wrote 2 eBooks in 21 Days; Damn Funny. Seriously. a diary-like eBook he wrote while he was writing THE BREAD IS IN THE BED; How to Make More Money as a B&B Innkeeper . 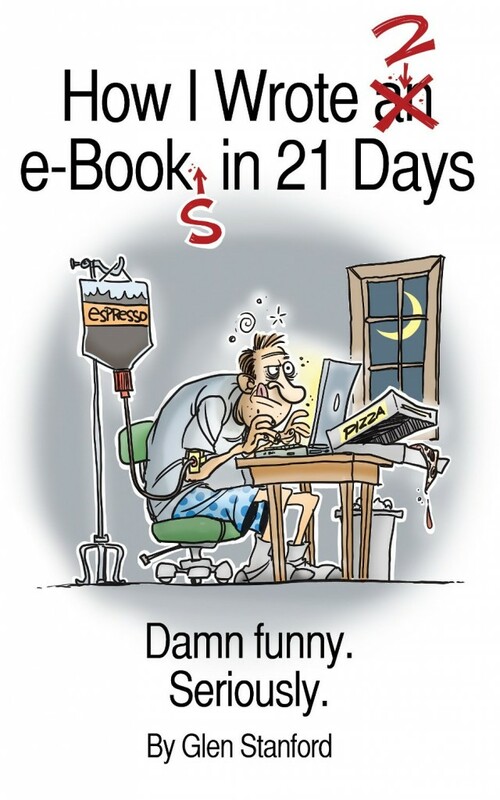 How I Wrote 2 eBooks in 21 Days; Damn Funny. Seriously. If you search Amazon for eBook writing tips, you’ll find tons of boring books written by pretentious people (OK, I’m exaggerating) who just love to tell you how do things the right way. While they might give you some useful advice, they are highly likely to bore you to death and make you feel like a miserable failure before you even start writing. Well, ditch these books and read “How I Wrote 2 eBooks in 21 Days” instead. Not only will it cheer you up, but it will also give you some friendly tips and mention some mistakes you can learn from for good measure. When you start reading this book, you will immediately understand that its author is an energetic, enthusiastic (sometimes overenthusiastic) guy with a terrific sense of humour who doesn’t give up easily. He wanted to write a book and so he wrote two. And published both successfully despite being a complete noob who isn’t exactly all that friendly with computers. “How I Wrote 2 eBooks in 21 Days” shows you his daily life for the 21 days he was writing the books. It will prove that an ordinary person who gets distracted by things like Comcast guys, MS Word problems, Photoshop and fishing classes, mother-in-laws and what not can still write and publish two cool books in only 21 days. And it will give you inspiration to start that eBook of yours. Oh, and it will make you laugh out loud.